Published: July 25, 2017 at 10:41 a.m. Updated: July 25, 2017 at 07:13 p.m.
OXNARD, Calif. -- Flanked by 13 cheerleaders, an inflatable football stretching into the sky and a Dallas Cowboys star looming even larger, owner Jerry Jones told the assembled crowd Monday that he's never been more excited about an upcoming season. Less than 30 minutes later, the Cowboys announced they would release return man Lucky Whitehead. Jones' Cowboys are always a spectacle, even in the usually sleepy first few days of training camp. Whitehead's reported June arrest on misdemeanor petty larceny charges, just one week after Whitehead said his dog was stolen for ransom money, proved to be an even stranger story. Police confirmed to NFL.com on Tuesday that the arrest was a case of mistaken identity. Still, VP Stephen Jones and head coach Jason Garrett reiterated Tuesday that the team is moving on without Whitehead. Jones stressed Monday evening the team had given Whitehead "a lot of different chances," but this now-confusing release is added to an offseason overstuffed with uncertainty. Linebacker Damien Wilson and cornerback Nolan Carroll were both arrested over the last two months. Defensive end David Irving was suspended four games for violating the league's performance-enhancing drug policy. Rookie cornerback Jourdan Lewis, taken in the third round, is in the middle of a domestic violence trial related to an incident that occurred prior to the draft. 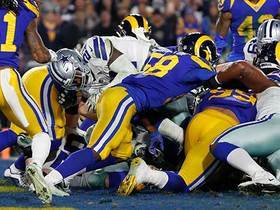 Perhaps most noteworthy to the Cowboys' bottom line: The NFL investigation into multiple incidents regarding star running back Ezekiel Elliott is expected to wrap up soon. Cowboys VP Stephen Jones, now taking some of his father's duties as the designated Jones to address thorny news, insisted that cutting Whitehead wasn't a reaction to a team-wide discipline problem. "We're not worried about sending a message," Jones said Monday. "We're worried about his situation and we looked at his full body of work and decided to move on." All the off-field storylines have overshadowed the ambiguity throughout the rest of the roster. Unlike the NFC champion Falcons, the Cowboys have to answer a number of questions before training camp breaks. The vaunted offensive line has two starting jobs up for grabs. The pass rush, so quiet late last season, is still looking for the right mix. And four key members of the team's secondary departed in the offseason, leaving a number of snaps available for newcomers. Whitehead's release is only the start of what should be a newsy month for the Cowboys. Asked to evaluate his cornerback position Monday, coach Jason Garrett quickly mentioned the improved health of Orlando Scandrick and the fast impression made by free-agent pickup Nolan Carroll. 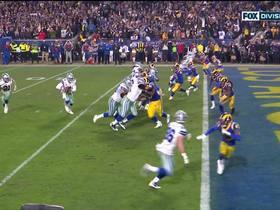 And then Garrett paused for four seconds, which can feel like 40 to a gaggle of sportswriters in ill-fitting shorts. "Who else?" Garrett asked to himself, breaking the silence, before mentioning the contributions made by Anthony Brown, a sixth-round pick last year. This is a group that will take some getting used to. 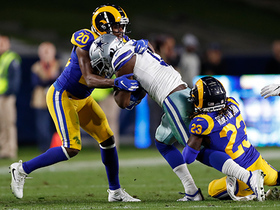 Gone are Brandon Carr and Morris Claiborne, who, along with departed safeties Barry Church and J.J. Wilcox, accounted for more than 6,000 snaps over the past two years. The Cowboys drafted three cornerbacks to replace them, including the aforementioned Lewis, who is handling his legal problems before arriving at camp. Only Scandrick and Carroll have significant NFL experience. "They are young, man," Carroll told me about the defensive back room. "It's crazy I'm the older guy now." It's also a little crazy that Carroll, 30 years old and coming off a rocky season in Philadelphia, is viewed as the heavy favorite to start opposite Scandrick. If nothing else, defensive coordinator Rod Marinelli is used to coaching up a group that is a supporting cast to the team's offense. "We came into last season and most people said, 'Who are these guys?' " Marinelli told me, noting that he took tremendous pride in helping his former players get paid elsewhere. "It's our job as teachers to cultivate the next group." Marinelli is the team's ace in the hole. He stresses fundamentals, discipline and playing fast, traits that can make up for a lack of talent. His straightforward scheme should make it easier for his new secondary charges to understand their roles. The defensive line has fewer new players, but it also needs to settle its starting lineup before Week 1. For the first day of practice, the team's base lineup included defensive end Tyrone Crawford, defensive tackle Maliek Collins, defensive tackle Cedric Thornton and defensive end DeMarcus Lawrence. First-round pick Taco Charlton and last year's fourth-round pick taken ahead of Dak Prescott, Charles Tapper, are waiting in the wings. Marinelli didn't sugarcoat that his pass rush "has to be better" -- and that's only going to happen if his young players step up. The same is true on the offensive line, where right tackle La'el Collins and guard Chaz Green are the early favorites to take over starting jobs. The two linemen have combined to start zero games at their projected positions, but the Cowboys showed great faith in Collins on Tuesday by handing him a two-year, $15.4 million extension. The stability of the Cowboys' key offensive players should carry this roster, but the off-field issues and roster holes signify a lot of concerns for a team coming off a 13-3 season. Just don't tell that to the fans who showed up in Oxnard on Monday. Fifteen hundred miles from JerryWorld, fans lined the Southern California streets hours before the first practice of training camp. Stands were packed, Super Bowl exhortations aplenty during stretching, with some of the loudest cheers reserved for Elliott. The arrests, possible suspensions and depth chart dilemmas were secondary to the joy of Cowboys football being back. 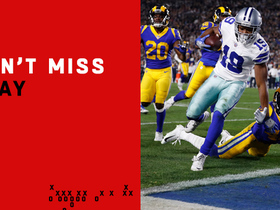 Most NFL teams preach to "ignore the noise," but the Cowboys all but embrace it. Making noise is what the Cowboys do best.